← Is Not Jesus Enough? She drew hope from this visual parable, hope that the spiritual dormancy she witnessed in a barren land would result, in God’s timing, in a “sudden miracle bloom out of these parched countries, and to show that He is ‘King over all the earth. 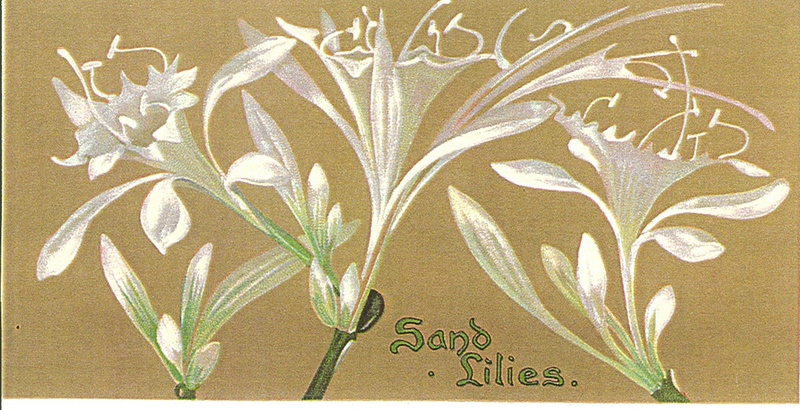 '” The painting of Sand Lilies featured above was reproduced from the cover of a little booklet presenting both her belief in a day of dawning spiritually and a plea for prayers on behalf of that vision. Frequently the image of the “sand lily” would appear in her various writings circulated amongst fellow missionaries and partners in prayer. The sand lily has taken on another meaning to me, first, in relation to Lilias who aptly was called “Lily” by her friends. Studying archives of her childhood, I witnessed the English Lily, nurtured in an ideal garden climate – rich, well-drained soil, moist air, sheltered site – the perfect environment for a pristine lily. All the natural resources – heredity, home environment, intellectual and artistic stimulation, spiritual nurture – would become “stored energy,” spiritually speaking, requisite for survival in the harsh Algerian soil. The Desert Lily! Then I consider the implications of this concept of “stored spiritual energy” for myself, for others… Scripture, on the one hand, speaks of a kind of “spiritual currency” which, in God’s economy, is not stored in advance to draw upon at will but given directly by God, to meet the need of a given situation. On the other hand, not contradictory to that special dispensation of “grace,” is the continual challenge of Scripture to be “rooted and built up” in Christ, “strengthened in the faith as you were taught.” (Colossians 2:6,7) As with Lilias, certain factors contribute to the formation of our souls: heredity, environment, nurture, experiences good and difficult. Scripture continually challenges us to turn over all things – good and bad; past and present – to God for Him to work for our good. . . for the growth of our souls. There is a strong parallel to physical training and spiritual formation. Just as a person builds strength and endurance through certain physical disciplines, we build a muscular faith by spiritual disciplines that sustain us daily and provide inner support in times of duress: meditation on Scripture, prayer, worship, service, fellowship with other believers. One could say that we are cultivating “stored energy” to be drawn upon in time of draught, when our soil is parched, no rain in sight. Desert lilies. This entry was posted in difficulty, growth, life and tagged art, growth, inner resources, Lilias Trotter. Bookmark the permalink. Lilias focused on them (sand lilies) … and Him. You focus on them … Him … and, us.